For thousands of years, people in India have per formed padayatras (“walking festivals”) to tour holy places and spread spiritual teachings. Like many great spiritual teachers before Him, Lord Caitanya went on padayatra. For almost six years He walked throughout India to spread the chanting of the Hare Krishna maha-mantra and establish the superiority of Krishna -bhakti. In 1953, Srila Prabhupada, the Lord’s own senapati-bhakta (“commander- in-chief devotee”), used padayatra to spread Krishna consciousness in Jhansi, Uttar Pradesh. His regular sankirtana party around the city would attract up to fifty followers. His instructions on conducting oxcart padayatra to bring Krishna consciousness to the villages of India resulted in two long padayatras in 1976. 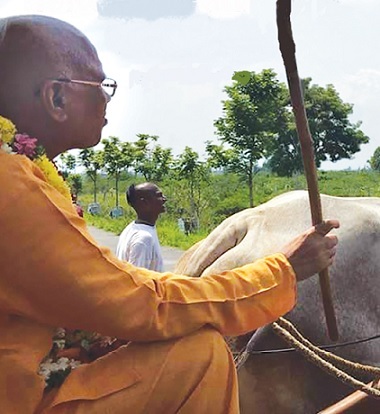 He appointed Lokanath Swami, an Indian disciple who grew up in a village, the leader of the group walking from Vrindavan, Uttar Pradesh, to Mayapur, West Bengal. Their most important programs took place in the evening in halls, temples, and courtyards, and on farms. Because entertainment and public events were rare in the countryside, entire villages would attend the programs, which consisted of an arati ceremony for the traveling deities (Sri Sri Nitai-Gaurasundara [Caitanya Mahaprabhu and Nityananda Prabhu]), a long kirtana, a philosophical talk, and prasada. The biggest attraction may have been the few Western devotees, since at that time most of the villagers had never seen a foreigner. The main reward for Lokanath Swami was seeing Srila Prabhupada’s beaming smile when they reached the Allahabad Kumbha-mela and his overwhelmingly loving reception when they arrived in Mayapur. ISKCON’s first grand-scale padayatra, led by Lokanath Swami, was a phenomenal success. Some of the highlights: an elephant, several oxcarts, a camel cart, tent programs attended by thousands, kirtana groups of 50 to 200 devotees from different nations,a large advance party with up to seven vehicles, book distributors joined by busloads of local devotees, amazing receptions, Food for Life prasada distribution almost every day, dioramas and exhibits, numerous favorable articles in nationwide newspapers, meetings with officials, VIPs, politicians and religious leaders, visits to many places of pilgrimage, and abouttwenty thousand people viewing Sri Sri Nitai-Gaurasundara daily. Padayatra had revealed itself as a truly grassroots movement for spreading Lord Caitanya’s message. It was just too good to stop in Mayapur. After its initial successes, Padayatra India continued in a more humble way. The highlights of this decade were the inauguration of ISKCON’s annual Vrajamandala- parikrama and Navadvipa-mandala-parikrama (tours of Vrindavan and Mayapur), the trek to Badarikashrama in the Himalayas, and the erection of the Padayatra Gate in Dwarka. Devotees also organized walks in Orissa, West Bengal, and Maharashtra. In 1991 Lokanath Swami, now ISKCON’s Padayatra Worldwide minister, started to plan for padayatras in a hundred countries as his Centennial offering to Srila Prabhupada. The first walks were in Mauritius, Guyana, the USA, Mexico, and Ireland. Padayatra was emerging slowly but definitely as an effective tool for spreading Krishna consciousness, and it gradually gained support from ISKCON leaders and members. Another reason for the padayatra explosion was that organizers learned how to adapt the program to their own countries using horses instead of oxen, or using no animals at all, driving through uninhabited areas, and using boats or planes to get from island to island, as in the Indian Ocean and the Caribbean. Several padayatra teams became permanent traveling parties, includingPadayatra America, which continued on to Central America, and Padayatra Europe. Padayatra enthusiasts emerged. 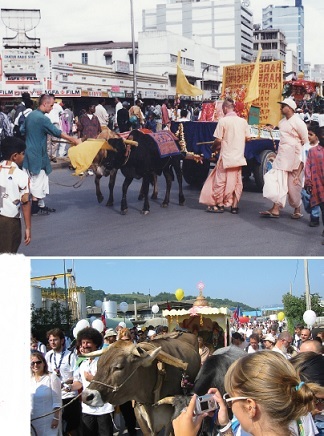 Paraçurama Dasa organized walks in more than thirty countries, and in 1992 started his Vrajamandala oxcart padayatra. Bhaktimarga Swami walked alone across Canada. And Jaya Vijaya Dasa led Padayatra India for ten years. Srila Prabhupada’s Centennial Celebration in 1996culminated in a series of special events, including Global Padayatra Week. By the end of 1996, padayatras had taken place on four continents, in 105 countries, including communist countries (Cuba) and Muslim countries (Malaysia, Bangladesh, and Pakistan). Padayatras have proved to be an excellent tool to unite, reunite, inspire, and rejuvenate devotees. All the elements for rapid spiritual advancement are magically concentrated around the padayatra traveling temple: constantly chanting the holy names, associating with sincere and advanced devotees, hearing and talking about Gaura-Nitai and Radha- Krishna , living intimately with the deities, distributing books and serving in many other ways, sharing Krishna consciousness with the public, experiencing exciting adventures, taking part in many cultural festivals, subsisting on healthy and abundant prasada, and – most important – receiving the blessings of Srila Prabhupada and Sri Sri Gaura-Nitai. In 1996 there were still about 123 countries through which padayatra had never walked, and even in the countries devotees had visited they had passed through only a small number of places. Lokanath Swami believed that as long as Padayatra India stayed on the road, the expansion of padayatra worldwide would continue. And Padayatra India has kept going. The participants have changed, but one constant has remained – book distribution, by which the party has become self-sufficient. Padayatra India has been on the road since 1984 and is now in Andhra Pradesh on its sixth tour of the country. Besides padayatra’s public appeal, its tremendous success in the media, and its spiritual rewards for ISKCON’s devotees, there were other reasons to keep padayatra alive. For example, with its emphasis on ox-power, it is an integral part of Vaisnava culture. Srila Prabhupada often warned us that modern civilization can be finished at any moment. If the oil runs out or the transportation industry fails for any reason, Krishna's devotees will be ready to rely on their God-given feet and the oxen, to continue bringing the holy names to every town and village. 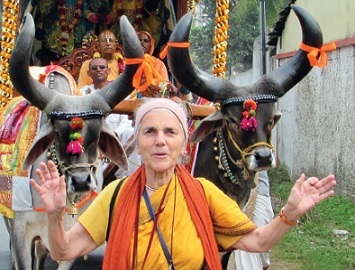 Bhakti Raghava Swami, minister of the ISKCON Daiva Varnaçrama Ministry in India, foresees the day when every state in India will have its own permanent oxcart padayatra. Already one small party headed by Visnusvami Dasa has been traveling nonstop in Andhra Pradesh since December 2012. After 1996 the padayatra fever generated at the time of the Centennial kept burning strong. Many countries organized new walks: Hungary, Italy, Russia, Netherlands, Brazil, Argentina, England, Philippines, South Africa, and New Zealand. Padayatra was taken to two new countries, Madagascar and Taiwan, and it became an annual function in the Czech Republic, Guyana, Mauritius, Orissa, and Slovenia. Avadhüta Siromani Dasa and his wife, Candrabhaga Dasi, walked with a horse-drawn cart from Pennsylvania in North America to Ecuador in South America. ISKCON devotees kept innovating. One successful innovation was to take part in existing walking pilgrimages, such as the Walk for Peace to Assisi in Italy, the St. James Way in Spain, and the Dindi-yatras in Maharashtra, India. This reduced the devotees’ organizational work and increased the opportunity to share the mahamantra and Lord Caitanya’s message with a huge number of souls. For the past eighteen years, ISKCON devotees have been walking with other pilgrims during the four main annual Dindi-yatras, which the devotees of Lord Vitthala (the Krishna deity worshiped in Pandharpur and throughout Maharashtra) have been doing for more than seven centuries, singing devotional songs and chanting the Lord’s names along the way. Numerous articles show that walking is one of today’s fastestgrowing trends. More and more people walk to work for their health. Some go on organized walking tours during their vacations. There’s even a revival of walking pilgrimages among Christians. In 2013 alone 215,880 people walked the St. James Way through France and Spain for spiritual growth, introspection, and rejuvenation. So why not walk with and for Lord Caitanya and Srila Prabhupada? Our founderacarya once said that with Lord Caitanya’s appearance the Krishna consciousness movement would become prominent for ten thousand years – the Golden Age within Kali-yuga. Padayatra is at the heart of that prediction, and our ecologyfriendly oxcart padayatra is now more relevant than ever. Our planet is becoming more and more uninhabitable, with its increased pollution, climate changes, and natural disasters. While spreading the holy names and knowledge of Krishna , padayatris can teach cow protection, ox-power, and respect for Mother Earth. Lord Caitanya keeps inspiring ISKCON Vaisnavas to spread the holy names more and more, sometimes in conjunction with padayatra, as is done in Mauritius during the annual World Holy Name Week. We pray that more temples will follow in the footsteps of these devotees and thata new padayatra explosion will take place in the world to celebrate ISKCON’s fiftieth birthday. Padayatra is an easy, joyful way to distribute the tasty fruits of love of God and thus relieve the Lord of the anxiety He feels for the suffering souls of this world. Gaurangi Devi Dasi has been coordinator for the Padayatra Worldwide Ministry since 2012. After serving for five years in the Padayatra office in Delhi, she continued assisting the ministry by writing articles for the Padayatra newsletter and compiling the Padayatra manual. She’s now producing the newsletter, coordinating the website, and editing two books on padayatra. Email: gaurangi.lok@gmail.com.